Whether you’re active in your local sports team or enjoy high-action activities, a professional mouth guard created by your dentist offers protection for your teeth, jaw and beyond. Smile Gallery Dental Clinic specialises in custom fitting mouth protectors designed to cushion and reduce the risk of serious teeth and mouth injuries. In essence, a sports mouth guard acts like a helmet for your teeth. These tough and versatile devices are moulded to the unique shape and curvature of your teeth. 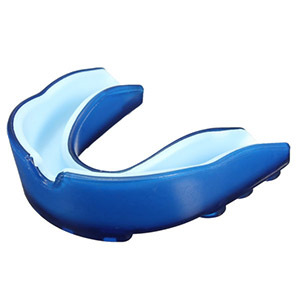 Unlike an over-the-counter mouth guard, which is made from lower quality materials, a sports mouth guard uses an advanced material to withstand high-impact activities. What sets this type of mouth guard apart from its non-medical counterparts, is its ability to perfectly match the unique landscape of your mouth. Made from a plastic solution known as Ethylene Vinyl Acetate, or EVA, this durable material is easily moulded to perfectly match your teeth. Because it seamlessly rests over your teeth and gums, blows to your mouth or jaw are cushioned to prevent both localised and widespread injury to your neck and brain. While you may think the process of a custom sports mouth guard may be complex, it’s actually quite simple. During your appointment, your dentist at our Box hill clinic will take impressions of your teeth by instructing you to bite onto a specialised impression tray. Once satisfied with the quality of the impression, the moulds are sent to the laboratory where the guard is manufactured. When ready, you’ll revisit your dentist and ensure the mouth guard is a perfect fit. Although its material is durable and designed to last, it does require replacement over time. Make sure to bring your mouth guard with you to all dentist appointments. at (03) 8595 2632 right away! Our dentists in Box Hill offer the experience and professionalism to safeguard your teeth with a customised sports mouth guard!